Because I am with a 2 year old during the day I am constantly looking for a way to entertain him. No matter whether it’s by keeping him busy, keeping him out of trouble (! ), or teaching him, I want to keep his brain, body, and little fingers busy. Here is a fun toddler fine motor skill activity that HE discovered on his own by busting into my craft box. I have lots of sheets with punch out letters that are on a strong cardboard material. The pages were super cheap, actually just a few dollars, and Phoenyx discovered that punching them out was fun! As a parent I discovered that him punching them out meant a good amount of quiet time…..and gave him some dexterity practice. PLUS once they were punched out we could discuss the letters! 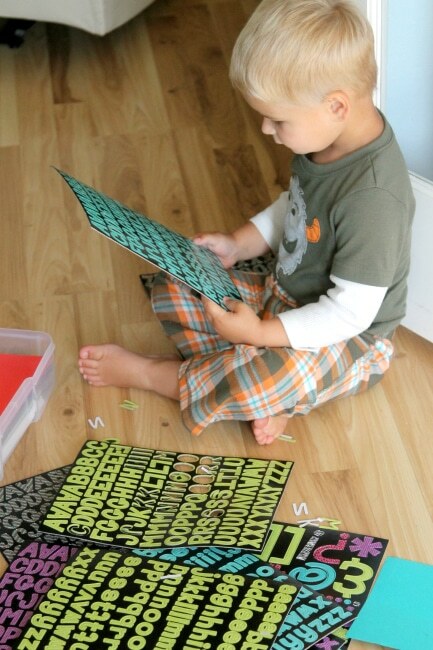 Phoenyx hopes this idea inspires you to put some punch out letter papers near your 2-3 year old. This is a great fine motor skills activity! And yay for all of the quiet time! I can totally see why it would keep him busy and happy. The colors are fun too! Simple but effective- love it! 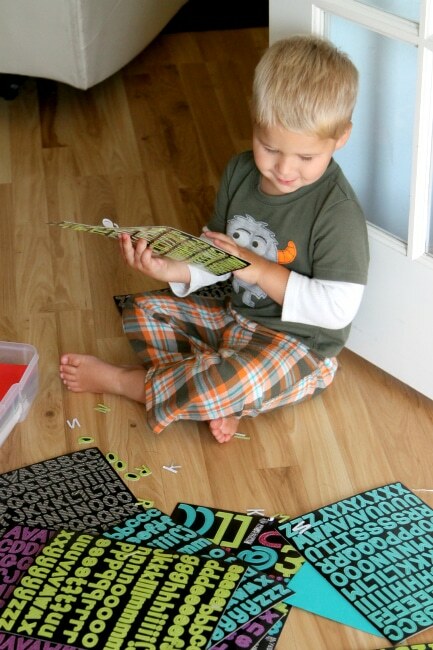 I love the easy ways that kids can keep themselves entertained- especially if it opens it up to learning as well! 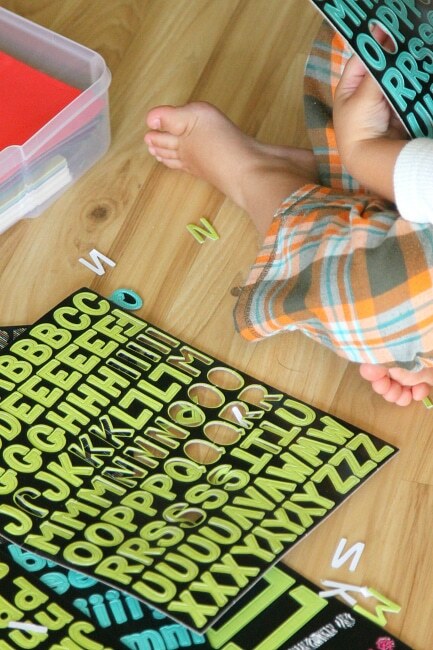 This is a great idea for developing those fine motor skills! P must be very patient. It sure looks like he enjoyed his playtime. This is such a great, simple idea for them to use their motor skills. I love it! Good idea, do you know where you got them?! Haha I love it. Working already! Sounds like his mom. Wow, what a cool idea. It is great that they come up with things that actually help children learn rather than amuse and entertain them. I love when they discover learning activities on their own! Brilliant! I have tons of punch out letters and numbers that my son Gabe would love to get his hands on. We’re learning numbers and letters, so this will be perfect for him. Thanks for the idea! That’s a great idea, and I love that it leads to talking about the letters and sounds. This is a GREAT idea! I know my girls would love this activity. This is a great idea. My 2 and 4 year old would love this. It would also be great for my 4 year old as he is learning letters. What a great idea! I love things like this that help the kids grow and learn while having a bit of quiet time. I love that idea. My son just turned 4 and we are working on the alphabet and combining letters to make basic words. These would be great for him.